Trail crews have been hard at work closing the gap on the Arizona Trail in White Canyon. I put out a call to my riding buds on mtbr to see who wanted to tag along to check on trail construction. We would need to get at least as far as my ride back in May, 15 miles one-way. We had a good turnout for this ride, 9 total at the start. 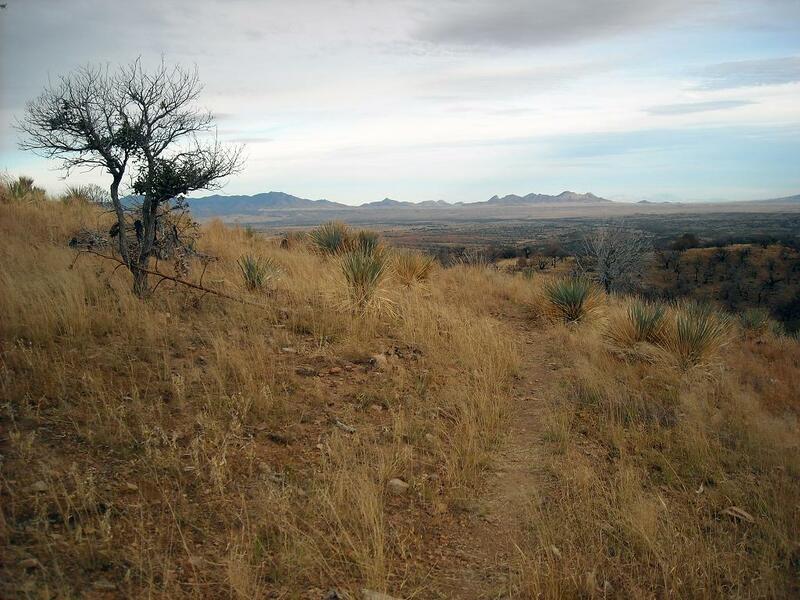 The AZT south from the Picketpost trailhead is in a dead heat with the Black Canyon Trail as being my favorite to ride. One bonus for this ride: it's only 45 mins. from my front door while the BCT is about 1 1/2 hours. The pictures will do most of the talking on this ride, truly spectacular especially after mile 12. Phil was a brave man, bringing out the SS for this one! Everytime Seron gets that burrito out I tell myself that I need to bring one next time!! So good. Dave leading the Specialized gang. Brian's ready for some catclaw!! Brent thanks you for paving the way. Brent & R.J. rolling onto FR4. Looking north on FR4 towards Superior. This is the overlook at mile 10. The trail drops down into a wash, then climbs back up to the low point on the horizon at mile 12. Looking east from mile 10. Sam at the bottom of the hill. Mile 12 or so, let the fun begin!! Seron eating up some sweet lines. Mile 14 overlook, all downhill to the Gila River from here! That bit of info courtesy of Scott & Lee's ride a week later. Mt. Lemmon off on the distant horizon. Danger lurks around every turn! Here's the proof we were looking for!! Back in May the bulldozer was near the bush just left of center, now the trail goes through to the southern section all the way to the Gila River! Only a short 3.1 mile segment near Kelvin is still under construction. Due to be complete by year's end. Here's the shot from May, notice the bush to the right of the bulldozer for reference. Great spot for lunch & our turn around point for the day, 15 miles out. What's not to like about riding a section of trail like this? Really glad the trail crew kept the trail high on the canyon wall. Always a good time when Sam is on board! Picketpost Mtn. in the afternoon sun. The great thing about this particular ride was being able to share the trail with good company. A few had never been out here, some others had not ventured as far south. There was such a good vibe afterwards that plans are in the works already for a return trip complete with shuttle so we can ride the full passage down to Kelvin. I can't wait! Here's a super video that Sam put together. Black Friday. That phrase is sure to invoke images of waking before the sunrise and wading through an endless stream of bargain hungry shoppers. It's not a scene for me. I'd rather sleep in, stay home or go for a bike ride! It just so happens that there is an underground, if you will, annual event on Black Friday dubbed The Flight of the Pigs ride. I heard about it last year, but was in no shape to attempt a 70 mile mountain bike ride, in addition I didn't know the secret handshake. What a difference a year makes. I wanted to join in on the festivities this year, but we already had plans to celebrate Thanksgiving on Friday due to my wife's work schedule. I decided it would be a cool adventure to go solo, not having to worry about keeping pace or meeting the 1 hour time cutoff early in the ride. I dubbed my ride on Thanksgiving day The Flight of the Turkey, why not? My route for the day would have me start & finish at the Pima Canyon entrance of South Mountain Park. I would take two of the more popular urban trails from coast to coast, National & Trail 100, connected by miles of street riding through downtown Phoenix. 8am rollout from Pima Canyon. Popular place prior to the turkey feast. Not all the riding was easy, National Trail will challenge you. I had only been as far west as the Ranger Trail on National, the last 5 miles all being new to me, I was a bit surprised at how many mines were out there. A glimpse back to the early 1900's. Uh oh. This wasn't supposed to happen with my tubeless setup. 1 mile from the end of National. As I soon found out , it was my fault for not checking my sealant for fluidity. It's good for about 2 months before a fresh coat is needed. Then multiple issues with my tube replacement put me behind schedule by an hour! I guess I'll be needing those lights after all. Taking a side street downtown over to Central Ave. It was nice riding through downtown on a holiday, hardly any traffic. Yes, this is still Central Ave. the skyscrapers make way for the golden hues of Autumn. TIme for a fuel break at the beginning of T100. The fiery glow of a desert setting sun over Four Peaks. Here I'm nearing the end of T100. One last short stretch of mtb trails through Papago Park. All in all it was a really fun day taking a tour of Phoenix. I'm looking forward to next year and being one of the Pigs! My GPS unit has been acting a bit silly lately. Only 7 1/2 hours into this ride the 'low battery' warning came on. I was really concerned because I wanted the entire route tracked. So when I stopped to refuel a couple of times I cycled the power down. After the second power down the warning went away & the unit lasted all the way until the final 5 miles! I was able to get another 3 1/2 hours after the initial warning?!?! I could easily draw in the last 5 miles with Topofusion to get the full track. This ride also happened to be my longest single day mountain biking ride, next up 80, 85? The extended part of this ride compared to last year afforded us the opportunity to ride some more of the AZT. This is always a good thing. As we made our way southbound over some jeep roads we heard the rumbling of some 4x4 behind us. We were a bit surprised at how long we kept in front of them, the road was extremely rugged by 4x4 standards, but perfect for some techy mtb climbing! The 4x's finally caught us and we pulled over to watch all 6 of them navigate the obstacle strewn incline. About halfway through the ride we found ourselves at the high point of the day, fantastic views to the south and into Mexico could be seen. As we left on the long downhill my bike started making a weird noise on the back end. I stopped a few times to pinpoint the source, but couldn't nail it down. I started back up and it went away. A few miles down the trail after some on and off again noise episodes I finally saw my dilemma. My freewheel was not so free, causing my chain to move back and forth jumping all over the place - hub was shot. My rear wheel had a significant amount of side to side play, the disc brakes were rubbing a bit, but the bike was still functioning. It had to. We were still about 18 miles from the finish line out in the middle of nowhere. Don't fail me now! Another wildlife first, tarantula munching on a grasshopper! It's hard to fathom sometimes that views like this are in AZ! We finished the ride in just under 8 hours, very pleased with our effort & pace on the day. My bike made it to the finish line mostly in one piece. I then proceeded to seek out rear wheel availability from my fellow riders. James came through with an offer I couldn't refuse, bike parts for beer! SOLD! We stayed around a bit for some post ride BS, then made our way back to Tucson for dinner. On to the next AES event, the McDowell 60. I found these next two shots very interesting, both taken near the same spot only one year apart. Amazing what difference a year makes.